Looking into the proverbial crystal ball, a slew of technology experts weighed in on the Future of the Internet V survey conducted by Pew Research and Elon University, and came up with a predictably mixed scenario: It's complicated. "In 2020 the brains of multitasking teens and young adults are "wired" differently from those over age 35 and overall it yields helpful results. They do not suffer notable cognitive shortcomings as they multitask and cycle quickly through personal- and work-related tasks. Rather, they are learning more and they are more adept at finding answers to deep questions, in part because they can search effectively and access collective intelligence via the Internet. In sum, the changes in learning behavior and cognition among the young generally produce positive outcomes." "In 2020, the brains of multitasking teens and young adults are "wired" differently from those over age 35 and overall it yields baleful results. They do not retain information; they spend most of their energy sharing short social messages, being entertained, and being distracted away from deep engagement with people and knowledge. They lack deep-thinking capabilities; they lack face-to-face social skills; they depend in unhealthy ways on the Internet and mobile devices to function. In sum, the changes in behavior and cognition among the young are generally negative outcomes." These points of view are presented in the context of statistics that show Internet and media use completely permeating young people's lives. From the Pew Internet Project: "95% of teens ages 12-17 are online, 76% use social networking sites, and 77% have cell phones. Moreover, 96% of those ages 18-29 are internet users, 84% use social networking sites, and 97% have cell phones. Well over half of those in that age cohort have smartphones and 23% own tablet computers like iPads." Some educators who took the survey were critical of the effect of technology on their students "hyper-connected" lives. But the writers of the survey posed an important question about why educators noted these negative impacts: "Is this at least partially due to the fact that they are still trying to educate these highly connected young people through antiquated approaches? Perhaps those who have argued for education reform would think so." 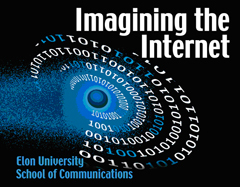 David Weinberger, senior researcher at Harvard University’s Berkman Center for Internet & Society: “Whatever happens, we won't be able to come up with an impartial value judgment because the change in intellect will bring about a change in values as well.” Alex Halavais, an associate professor and internet researcher at Quinnipiac University: “We will think differently, and a large part of that will be as a result of being capable of exploiting a new communicative environment,” he noted. It's a fascinating read, with lots of thought-provoking perspectives from experts, students, and educators. Be sure to read the report in full here.